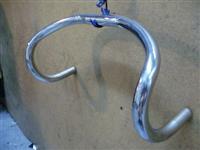 Description: track handlebar.made of steel,chrommed. it is 40cm.wide(center to center); Deep drop design , 26.0mm clamp diameter.will fit stems with26.0mm. clamp.